Where physicians get their information. Doctors use the internet all the time to gather medical information and to investigate new procedures. This trend has grown quite a bit in the past decade. Finding the right online resources is now part of most doctors’ routine. However, there is an overwhelming amount of information online. This can be even more of an issue for doctors, who are expected to find crucial information in the least amount of time possible. On the internet, it is easy to find both reliable and unreliable information. The problem is that some of these sites are so well-designed, they can be deceiving. It is the reason why I spent time researching genuine sites where doctors can find facts. Here are the top ten sites. I already did another article on the top ten online sites for patients. You can check it out. 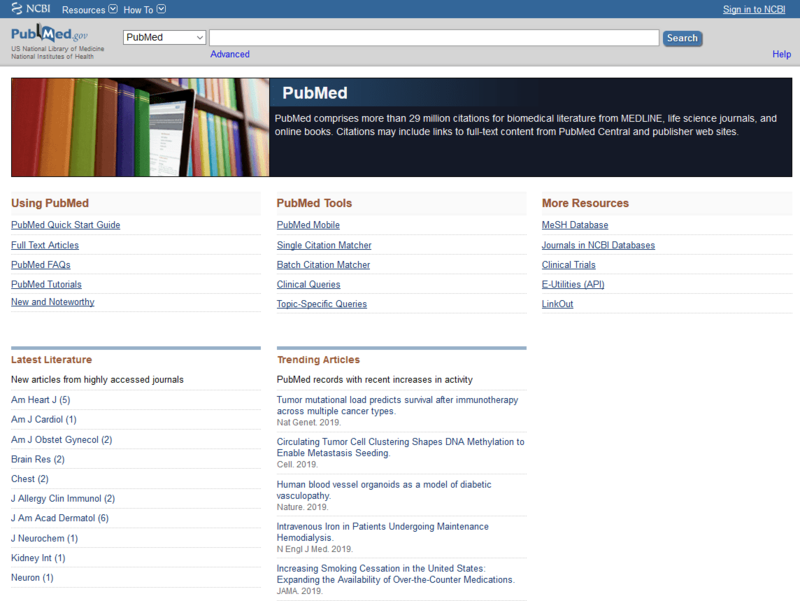 PubMed is a medical website from the US National Library of Medicine that is located at the National Institutes of Health. At this site, doctors will find abstracts as well as entire articles, which are peer-reviewed, on various medical topics. The reading is designed with medical experts in mind; doctors will gain insight into any new procedures or treatment options with ease. It will help them expand their knowledge based on particular medical topics. The site can also be a good place to refer patients who visit your practice to help them make an informed decision. This online resource comes with both a simple search feature and a comprehensive search feature. Entering key aspects of the subject in the search window is used to conduct a simple search. PubMed will then translate the simple search and add relevant medical subject headings (MeSH), field names, synonyms, and Boolean operators. This helps to enhance the search formulation for the doctors. For an optimal search in this site, you need to understand MEDLINE, its core component. It is especially important to understand the MeSH controlled vocabulary utilized to index all MEDLINE articles. You may also need complex search strategies such as proper use of limits, using field names, and much more. In short, the more you use this online resource, the better you get. Medscape is a high-quality doctor website that is targeted at medical professionals. Since it launched in 1995, the portal has received accolades from both physicians and the information sector. 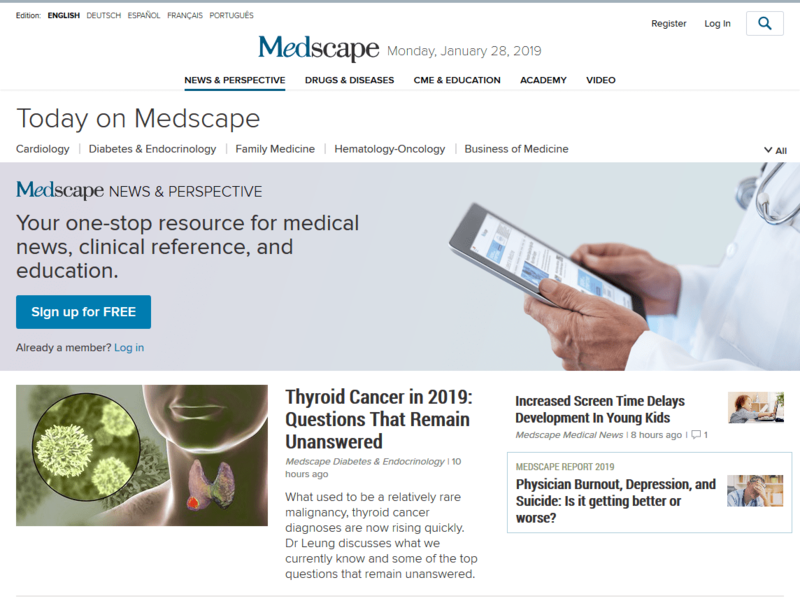 Since it launched, Medscape immediately gained popularity in the medical world as a starting point for high-quality peer-reviewed data. Besides that, users can also access other value-added services. As proof of how high quality it is, CBS bought a one-third stake in the company. It also has a strategic alliance with AOL to expand its reach in the medical world. One of its core roles is as an information aggregator. Users who register free on the site are able to access about 50 peer-reviewed journals, full-text articles. They will also gain access to professional trade publications, medical textbooks, and periodicals on medical news. On the homepage, you will find the latest news in the medical world and links to treatment updates, practice guidelines, conference schedules, a medical dictionary, and even patient resources. Doctors can view summaries on the latest peer-reviewed research from well-known medical journals such as The Lancet, JAMA, and the New England Journal. You will even find a version of the MEDLINE, AIDSLINE, and TOXLINE databases. There is also a drug database, which you can use without leaving the site. The site also creates unique content that is presented as seven peer-reviews online journals on the site. Another unique feature is “Next Day Summaries” that offers a summary of reports on presentations made at leading medical conferences. Although this site is full of information from nearly every aspect of medicine, it is quite easy to navigate. No matter what page you are currently on, each section of the site can be accessed with one or two clicks. There is a search at the bottom of each page, which allows users to search for any type of information. 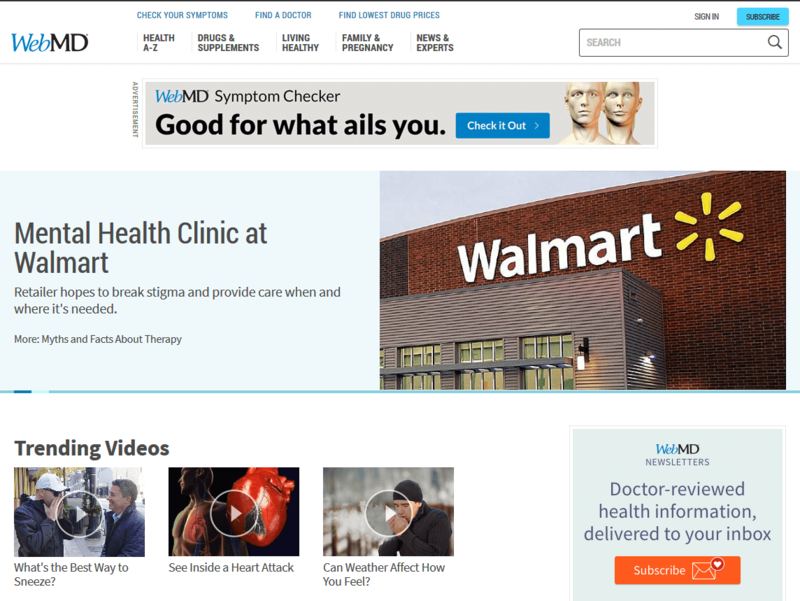 WebMD is an American company primarily known for publishing information on human health. The site is one of the top doctor websites as ranked by unique monthly visitors. The site offers services to medical professionals and clients as well. It publishes WebMD the Magazine, which is patient-focused publication found in 85% of all waiting rooms in the US. They are also the company behind Medscape, the trusted online resource use by many medical experts in the US and globally. They have a discussion board where doctors and patients can freely interact. This can help a doctor to provide insight to patients and gain some by following various discussions. For doctors who wish to gain a summary on a new medical condition, you can quickly look it up on WebMD. Besides that, you can use their database of drugs to gain insight on any new drugs released into the market. Most of their articles usually contain links to peer-reviewed facts that you can use to make informed conclusions. The WHO is a specialized agency of the United Nations that focuses on public health internationally. It also runs the https://www.who.int website. The organization’s constitution has been signed by 61 nations but it operates in every region of the world. Since establishment, the site has provided a significant amount of detailed information on diseases such as HIV, Ebola, Malaria, TB, and various other illnesses and fields. In general, if you are a medical doctor concerned with public health, this might be the most useful online resource in the world. On this site, you will find data, fact sheets, photos, and medical publications. They have a particularly comprehensive section on Ebola. There are very few medical experts with experience on Ebola, thus it might be worth visiting the site to learn more about the illness. For instance, you will learn about the protective measures to take, the symptoms you should check for and care. Best of all, you will get to learn which regions of the world might be facing an Ebola outbreak. This is especially important for medical doctors who travel often. It will help you to know how wary you should be and the protective measures that you need to take. 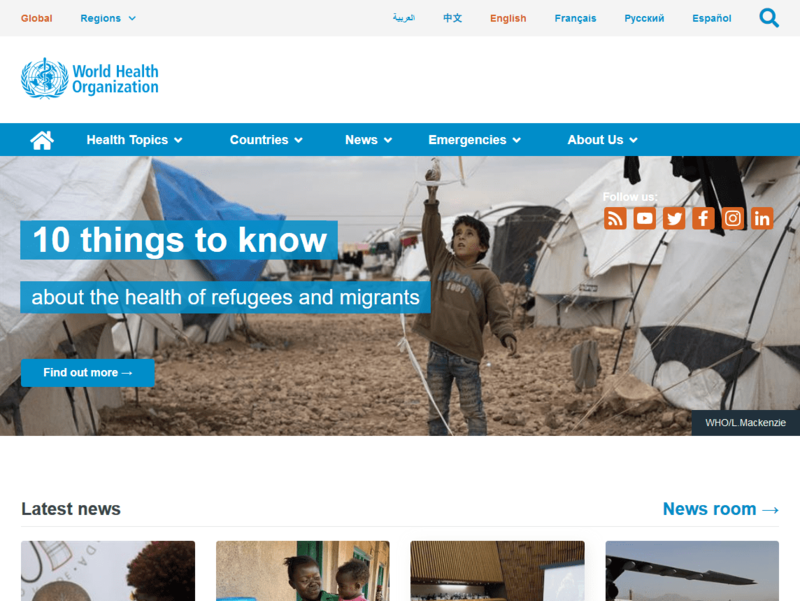 Besides provides facts and data on serious public health emergencies, the site also has a valuable news section. This section provides information on various events that are happening in the medical world. For instance, you will get to learn about various trends taking place in the world. This includes issues to do with child mortality, which is a major issue in some places in the world. This news sections can serve as a useful resource for those who are doing research on major public health issues globally. 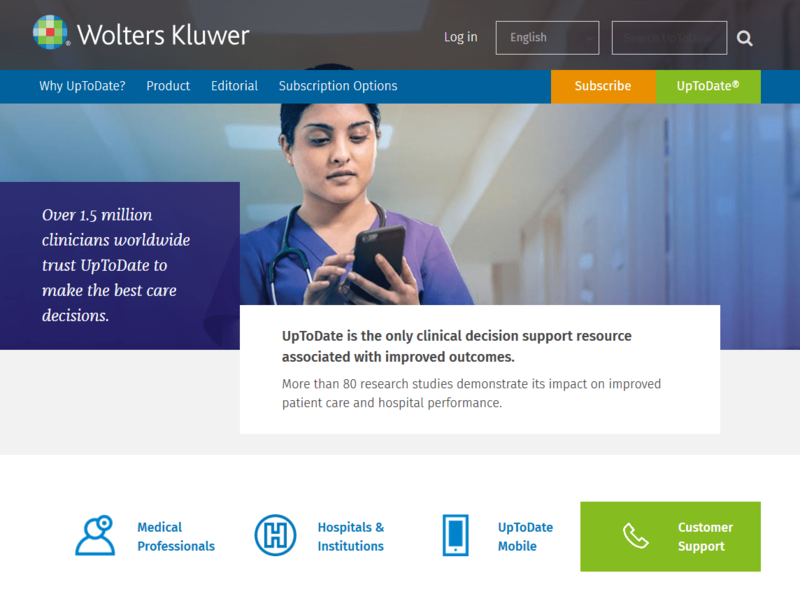 UpToDate is an evidence-based resource authored by physicians to support the decision-making process. Thus, it ensures that physicians make the right choice at the point of care. Over 6,500 globally renowned physician editors, authors, and peer-reviewers maintain the UpToDate resource. They use a thorough editorial process to ensure that they compile the most up to date medical data into evidence-based, trustworthy, recommendations that have been shown to help improve the quality of care. The resource is used by over 1.3 million clinicians in more than 187 nations and in over 90% of major medical centers in the US. As a result, they are able to offer the best medical care. There have been over 80 research studies, which have confirmed the widespread use of the resource leading to improved medical care. For instance, it has been shown to help cut down hospital stay, lower mortality, and reduce adverse complications, according to the UpToDate site. This valuable online resource has been around for over 25 years. In that time, it has managed to earn the trust of those in the medical community. One reason why it is so trusted in that it does not accept any funding from the pharmaceutical industry. The UpToDate online topics get over 43 million views each month. A survey in 2016 found that doctors found answers to their questions 94% of the time. The resource covers 25 specialties and over 11,000 topics with each topic answering a myriad of questions. 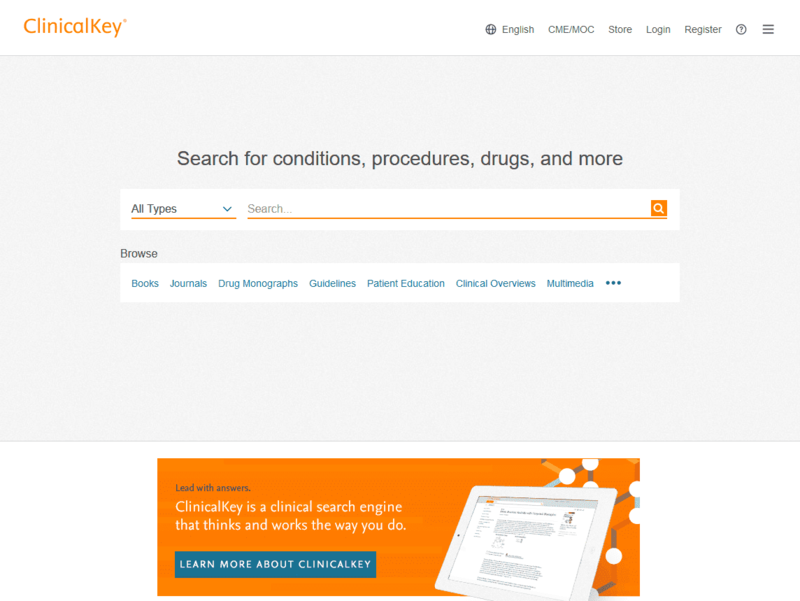 ClinicalKey is a medical database tool owned by Elsevier. It offers access to a huge medical library, which is also published by Elsevier. The database was created by the Global Clinical Reference team at Elsevier. To create the database, over 2000 medical doctors globally were consulted over the course of about two years. This resource has the sole goal of offering answers to clinical queries. It targets medical doctors, health institutions, schools, and universities. The resource also exists as a mobile app for both Android and iOS devices. Those who use this site gain access to over 600 journals, 17,000 medical videos, and 1,000 books. 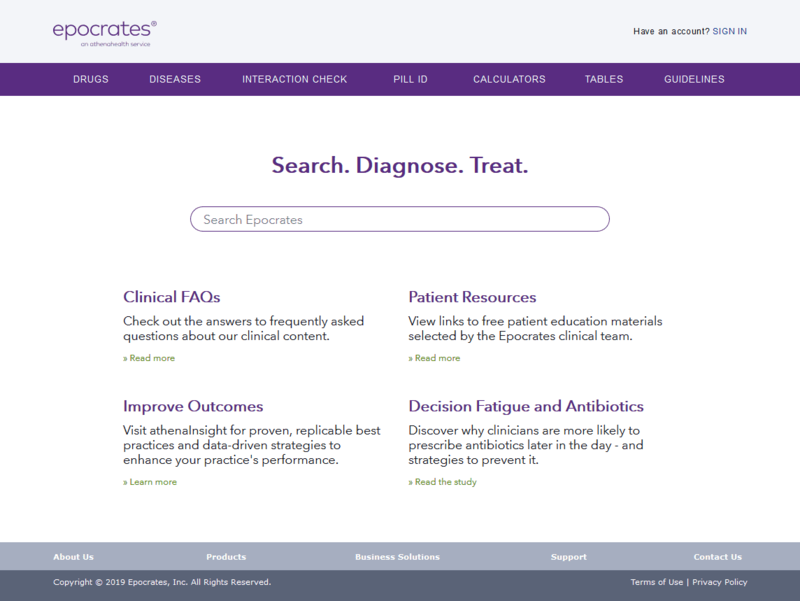 To conduct searches, the site uses taxonomy tags and other filtering tools such as by journal or by book, clinical trial, images, or the MEDLINE database. The site allows users to export images, citations, and copyright details into PP presentations. ClinicalKey emphasizes that all its data is evidence-based. Thus, you will find numerous evidence-based resources such as Goldman’s Cecil Medicine, Conn’s Current Therapy and much more. The site itself is also quite easy to navigate’ it has a simple design and color scheme that makes it easy for users to find what they need from the site with ease. 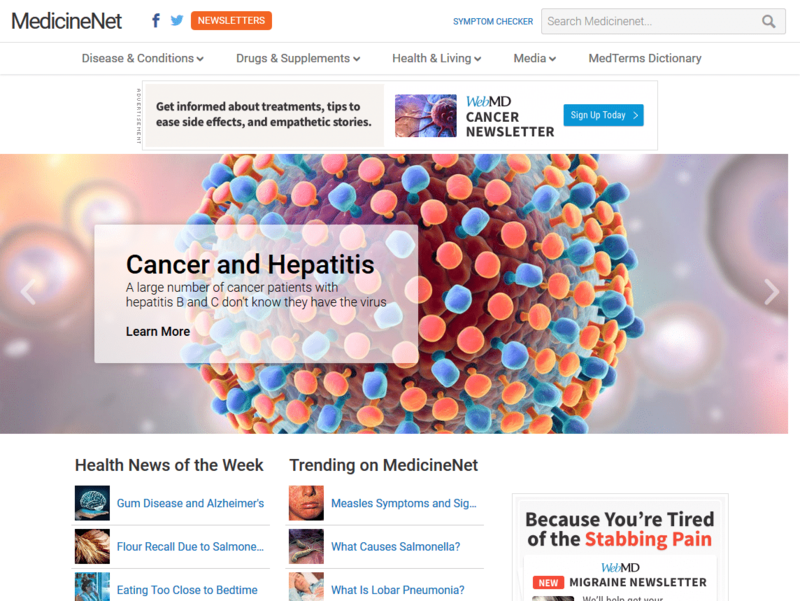 MedicineNet.com is a medical information site owned by WebMD. It offers newsletters, medical information and much more to readers. All the content found here is of high quality; board-certified doctors created it. The content is great for those who wish to get an insightful look into various health topics. The site is quite easy to navigate. You will find a useful navigation bar and options to browse news or various topics. Additionally, there is an option to go through the most popular searches on offer. There is an abundance of data on this site but it is well organized into bulleted lists, subtopics, and multimedia to engage the users. To ensure everything is as clear as possible, there are links in the text that lead to even more information. From a design perspective, the visual design can be a bit overwhelming at times. All the various elements appear to vie for the user’s attention. Thus, it is important to have a specific topic in mind to avoid losing focus when using the site. Despite this, you can expect to get high-quality information from this site. Articles are well referenced and all the information found here is written and reviewed by medical experts. A good sign of how high quality the information here is that the articles found usually contain the author’s credentials and name. As a medical expert, you can always contact them to get further details on any topic. Additionally, most of the topics have been reviewed within the past two years. This shows that information on this site is often updated according to new research. The American Medical Association is an association created for doctors in the US. It has an objective of promoting the art of medicine and science for the good of public health. 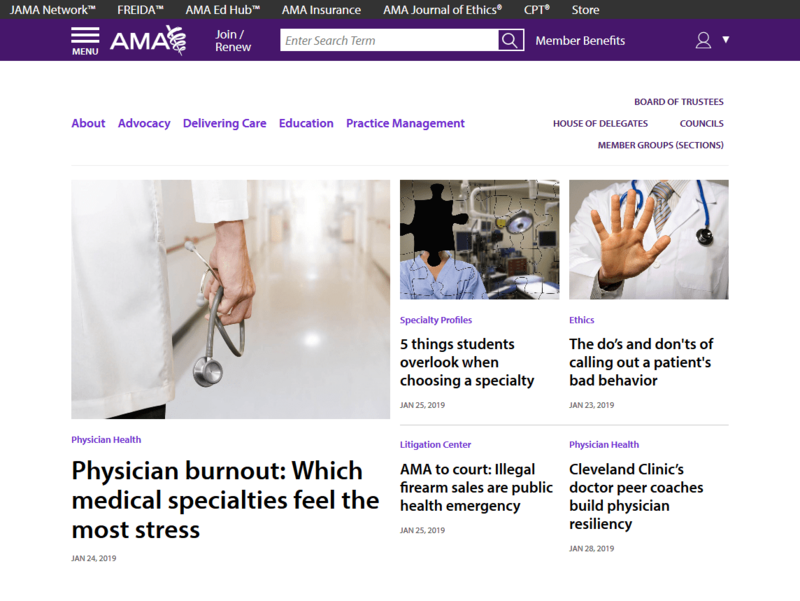 If you are looking for the latest developments in medicine, the AMA medical website is a good place to get started. The AMA website disseminates scientific and health information to the medical community and the public in general. The site is a good place to keep abreast with the latest developments in policy and legislation in medicine. It often represents the medical community on the US Congress and other government agencies. The agency plays a crucial role in setting the standards for medical schools and various internship programs. If you are a medical expert who wishes to understand quack remedies and charlatans in the medical world, this is the right place to be. This is a great site for medical experts looking for information on various topics regarding the medical profession. For instance, it provides details on how doctors can manage the financial aspect of the practice. Additionally, for doctors wishing to establish a practice in rural America, this will be a useful resource. The site does more than cover advances in medicine and associated legislation. The site covers all aspect of a doctor’s profession. If you are a young doctor who does not understand any aspect of medicine, this site will prove to be quite useful. Those in the medical profession with years of experience write all the information found here. Thus, reading the data written here is like getting wisdom from those who came before you in the medical world. This way, you can avoid any potential pitfalls that might arise. The NIH is an agency run by the US government. It exists to conduct medical research and is administered by the department of health and human services. It is comprised of about 27 separate centers and institutes, all dedicated to medical research. This is an important resource for doctors in various fields of medicine. It provides important peer-reviewed information that is accessible free. 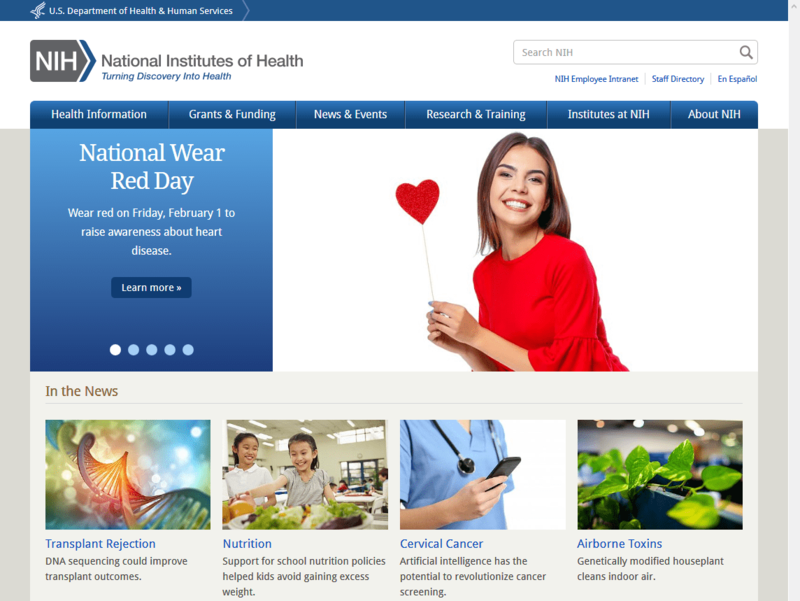 No matter which field of medicine you are in, you will find the NIH site quite useful. It aims to understand the cause of disease, prevention, detection, diagnosis, treatment, and control. The NIH often engages in research projects and thereafter publishes the finding online after careful review. This way, medical doctors in the US can grow their skills and knowledge thanks to ongoing research. As proof of how reliable its research is, the NIH has been involved in about 17 medical discoveries. These discoveries have helped to revolutionize healthcare in the US and around the world. If you are a doctor looking for breakthrough research, you will find the NIH quite useful. Epocrates is a mobile reference app that provides medical reference data on disease, diagnostics, drugs, and patient management. The app is designed with doctors and other professionals in the medical world in mind. Users can check drug dosing, drug interactions, medical news, disease management, disease diagnosis. Information is sourced from authoritative sources such as the FDA, it is the configured digitally to help with decision making during patient care. Other functions of the app include that ability to identify pills. It also has hundreds of risk assessment tools, therapeutic recommendation, and coding look-ups. In general, if you are a doctor who needs a quick medical reference to various aspects of medicine, Epocrates is the app to have. Another noteworthy aspect of this app is that it is free. It has received a lot of approval from both medical students and doctors. The user interface is also worth mentioning. It makes it easy to find any information one needs. Epocrates’ drug formularies offered by various insurance carriers are quite impressible. It helps doctors to prescribe medication that is covered under the insurance policy of the patient to reduce the copay for them. The formulary tool saves time for everyone in the healthcare industry. All one has to do is download the list of formularies and pick an insurance carrier to see the status of each drug. Another feature of this app worth noting is the drug alternative feature. You will find a list of alternative drugs that are covered under the insurance policy. The internet is full of factual and nonfactual websites that both claim to serve the medical community. However, it can be difficult to tell them apart. The list above can be a useful guide for those looking for information to serve their patients better.